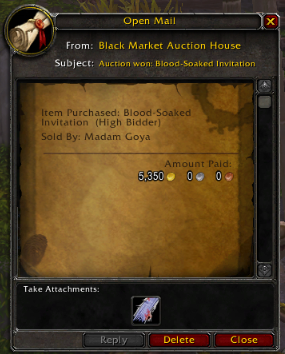 Although right now I'm really liking the feel of that Blood-Soaked Invitation in my pocket - despite the fact that it's, well... soaked in blood - I'm pretty nostalgic and sentimental when it comes to favorite items. A certain Crystalline Tear of Loyalty and a Gold Eternium Band hold their places in my bank. Four letters from a couple of years ago travel everywhere with me in my backpack. I really enjoyed the pre-Cataclysm elemental unrest event, which is why I've kept Sul'lithuz Scale Bracers, Amulet of Evil Winds and Ring of the Three-Headed Beast, but my all-time favorite piece of equipment is the Tabard of the Scarlet Crusade.